Super Hero Boy: Have you guys ever heard of Dr Syn? Have you guys ever heard of Dr Syn? I really thought I had seen almost every Disney movie ever made. I went through a phase as a kid where I loved watching the older live action Disney movies. I even named my first horse after a vintage Disney movie which I don't think I've seen in at least 20 years, Tonka. 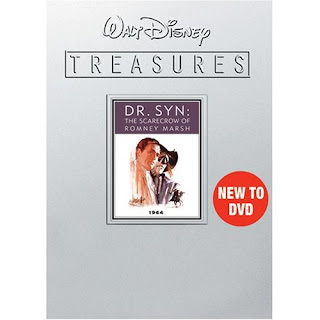 So when the newest Disney Treasures movie came across my desk, Dr. Syn : The Scarecrow of Romney Marsh I was a bit surprised. Dr Syn's story is actually really entertaining but there are some elements that seem a bit familiar a hansom well educated man turned swashbuckler who by day seems normal by day but at night wears a mask and beats up the bad guys though instead of giving cash to the poor or carving a Z into their chest he is attempting to save people from the royal army. It's actually a really cool story, Dr. Syn's alter ego Scarecrow reminds me a bit of something out of a batman movie crossed with kind of a bad Halloween costume but its actually really creepy. Actually the fact that his mask is so incredibly creepy threw me off a bit as this is a Disney collection. Though originally designed to be a three part TV series the movie seams together fairly well to the point that unless I had mentioned that you might not realize it at all. The film quality is decent considering it was aired in 1964 though the soundtrack does suffer which is surprising as usually the soundtracks are the best part about Disney movies and even cartoons made during this era had fabulous musical scores. I almost hate to say this but I would not recommend young children watching Dr Syn The Scarecrow of Romney Marsh as if you think that the latest Batman installment was too much visually for young children that you may find the scarecrow mask that Dr Syn wears strangely reminiscent of the Joker mask in Batman. Though otherwise the movie is very tame there is just something strangely unsettling about that mask. This coming form the same girl who's favorite movie growing up was the Dark Calderon and Labyrinth both dubbed during the time "too scary for kids". So that will have to be your call. I'm still just in awe of these Treasures DVD cases they are really pretty and incredibly well done. Each disc even comes with its own certificate of authenticity which if your into collecting Disney DVDs I know that a good friend of mine who is crazy about owning every Disney DVD ever released told me that the previous release of Dr Syn was incredibly rare and very desirable so this may just be a good investment for you collectors out there! You can get your own copy of Dr. Syn : The Scarecrow of Romney Marsh on Amazon right now!